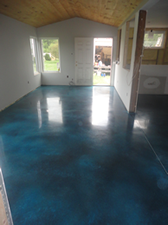 Concrete can be polished the same as granite, marble or terrazzo to create a non-porous, highly reflective, easy maintenance and attractive surface. Large commercial box stores are choosing polished concrete as a finished flooring because it is less expensive to install, is easy to maintain and attractive. Smaller businesses and homeowners have caught on for the same reasons with not only floors but counter tops as well.